What’s At The Heart Of Campaign Word Storms? Rice Business Professor Wagner Kamakura has created a tool called WordMap to analyze tweets in the current midterm elections. 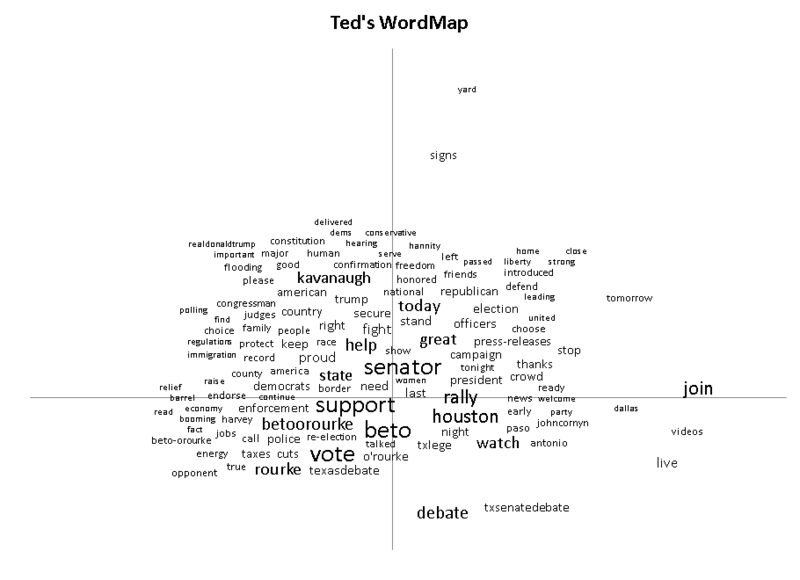 These images produced by WordMap are word clouds formed from the 500 longest tweets from U.S. Senate candidates Beto O’Rourke and Ted Cruz. WordMap can also be used to understand what consumers are saying about brands on social media. 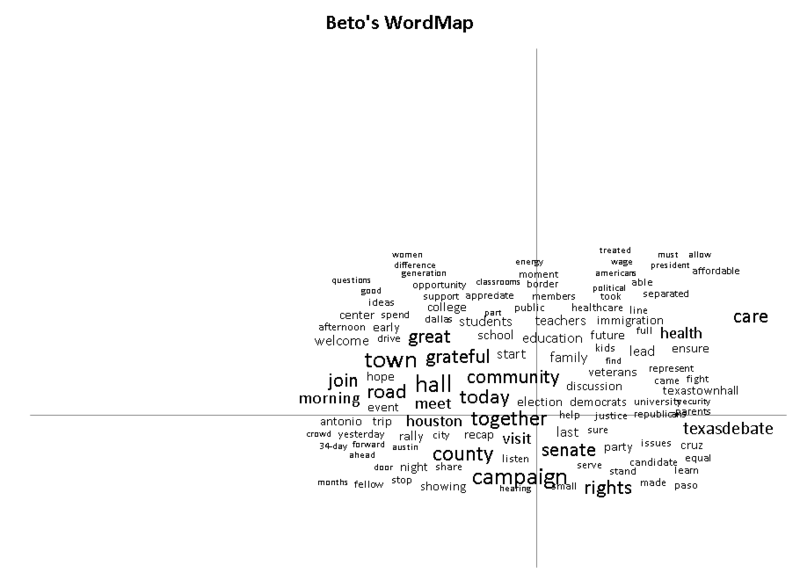 These images show word clouds formed from the 500 longest (more than 100 characters) tweets from competing U.S. Senate candidates Beto O’Rourke and Ted Cruz. I created the word clouds by some text-mining using my WordMap tool (you can view a YouTube tutorial video). The tool produces a word cloud that reflects not only the frequency of the words used by the two candidates (as other word clouds do), but also how often they are used in the same tweet. In these images, frequency is represented by the font size, while affinity is represented by proximity of the words in the WordMap. WordMap is one of the tools of KATE (Kamakura’s Analytic Tools for Excel), which I use in my Advanced Business Analytics course in the Rice Business EMBA program. WordMap can be used to understand what consumers are saying about your brand on social media, or to understand customer reviews. You can see a description of KATE here. I should note that WordMap tool is most useful for advanced users who are familiar with Excel add-ins. Its product, these candidate word clouds, like the candidates, speak for themselves. Wagner Kamakura is the Jesse H. Jones Professor of Marketing at the Jones Graduate School of Business at Rice University. Why hiring women for jobs left by abusive men gets everyone back on track. What is behind the ongoing scandal first exposed decades ago? Why President George H.W. Bush went to bat for NAFTA.